The annual full-day meeting on the rights of the child on 6 March focused on the protection of the rights of the child in the implementation of the 2030 Agenda for Sustainable Development. The 2030 Agenda was the central theme also in the SRSG annual report to the Council (A/HRC/34/45), which was presented on 7 March. “The real value and success of the Sustainable Development Agenda will be measured by progress made on the ground. And this requires leadership, accountability and sound monitoring mechanisms at the national, regional and global levels. Children’s voices and participation need to inform this process!” stressed SRSG Santos Pais. 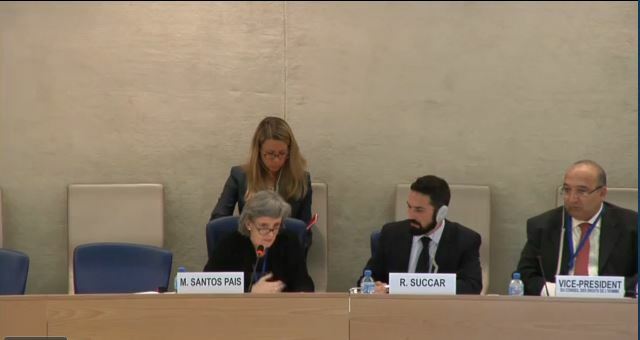 In the Human Rights Council enhanced inter-active dialogue on the human rights of migrants in the context of large movements, held on 10 March, the SRSG drew special attention to the devastating reality that countless thousands of children are desperate to flee from. To mobilize further action towards the violence related SDGs, especially goals 4 on education, 5 on gender equality and empowerment and 16.2 on ending all forms of violence, the SRSG launched the publication “Ending the Torment: tackling bullying fromthe schoolyard to cyberspace” with the Governments of Mexico, Norway, Slovenia,South Korea, Uruguay and the European Union, in close cooperation with UNESCO, UNICEF, OIF and ATD Fourth World. With the same sim, she supported the launch of the revised EU Guidelines on the Rights of the Child designed to advance implementation of the 2030 Agenda, and co- organized the event on violence against children in the Sustainable Development Agenda. Recognizing the need to place priority attention on children furthest left behind, and as Chair of the UN Task Force on Children Deprived of Liberty, she joined partners in the event calling for strong support to the Global Study onChildren Deprived of Liberty, and was a keynote speaker in the event on access to justice in the juvenile justice system, hosted by the government of Indonesia in collaboration with the governments of Norway, Peru, Malaysia and South Africa.